We spotted a few great ideas in the Houzz home tour of Brian Gibb and photographer Misty Keasler, a creative Texas couple who have figured out how to have little ones and show off their love of quirky art. The one we loved the most is putting a screen door on a kid’s room. As anyone who has ever tried to get a little one to sleep knows, sometimes the lights go off, sometimes they stay on. Sometimes the door is closed, sometimes it stays open a crack. In our house, this latter option never works, because our puppy Cupcake takes that as invitation to enter, and he doesn’t go to sleep quite as early as our girl. Solution? Interior screen door. Pretty wooden ones like the one in the photo above are available at Home Depot. They’re affordable, lightweight, and paintable. What’s best is that they allow you to keep the room contained — no unwelcome pets or siblings wondering in — while allowing light and air to circulate. Genius! 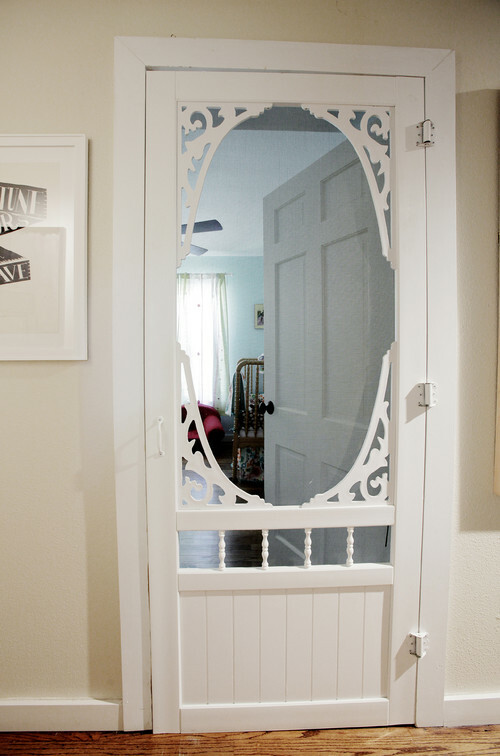 What do you think: Would you install an interior screen door anywhere in your house? Kid’s room? A home office? floating doggy beds: would your pooch perch on one of these? Here we are in the dog days of summer and I’m wondering, what do we need to do get our labradoodle Cupcake into the water? I know he doesn’t mind getting wet — he insists on being outside during rain storms and once took an exploratory dive into the neighborhood duck pond — but our attempts to get him into lakes and pools have been futile. He just doesn’t seem to want to swim. I know he can. He has webbed feet, for goodness sake! His aquatic genes might be a bit to recessed to play fetch in the water, but perhaps he would like to float? These doggy pool drifters from Frontgate sure look comfy. Essentially they’re beanbags that don’t sink (do any beanbags sink?) and they’re stain and mold resistant. My question is this: How the hell do you get him on top of it in the first place? I’d love to see the video on that, wouldn’t you? Does your pooch like the water? Let me know your advice on getting him cool off with us. The Puppy Files: The Cutest Dog Ever? We’re always on the lookout for chic pet furniture, but as any feline owner goes, usually the pretty perch the less interested the cat is in sitting there. This clever new idea may just be the thing to lure your cat off your favorite Sarrinen chair and onto a place that is cozy, protected and built just for him. It’s the Cat Crib, a hammock-style bed that ties to your chair’s legs and creates a nice nest for ol’ Kitty. It’s great for small spaces where you don’t want to take up valuable square footage with pet furniture. It’s machine washable as well. Available for $29 starting in September. Click here to reserve one now. I’m writing this tale in hopes of preventing others of making the same mistake, though I will likely seem pretty damn foolish as I do so. You see, I know that raisins are bad, very bad, for dogs. And I know the safest place for puppies when you can’t watch them is in a crate. Yet, I somehow seemed to carelessly forget both of these things and our insanely loveable, six month old labradoodle Cupcake managed to devour a snack box full of raisins Saturday afternoon. Thank heavens he’s fine now, but let me tell you of our scare. We went upstate to spend the night in our little cottage. We only have one crate for Cupcake and though it collapses, we stopped bringing it on overnight trips with us a month ago. Cupcake sleeps solidly through the night at the foot of our bed, and we never leave him alone long enough to get into trouble during the day. That was until Saturday, when the three of us headed out to a restaurant leaving our dear little pooch alone for a couple of hours. Coming home with our bellies full, we open the door to find Cupcake, happy and excited to see us as always, standing over a shredded box of empty raisins on the rug. I had left them in a bag on a chair, and now that too was on the floor. My heart instantly leaped into my throat. Raisins are on the list of things that are toxic to dogs (along with grapes, chocolate, onions, garlic, macadamia nuts). How toxic? I didn’t know and instantly started Googling “My dog ate raisins” to find out. The results terrified me. Eating raisins causes sudden kidney failure in some dogs. But the specifics were unclear: How many raisins? How quickly? Some dogs? This Snopes page offered some useful, albeit scary, background. Apparently, animal doctors made the link to kidney failure in dogs with grapes and raisins in late ’80s. They found that after eating a few ounces of them, some dogs would stop eating, have diarrhea, and grow lethargic. After a few days, they would not be able to pass urine, causing intense abdominal pain — and sometimes resulting in death. Everything I saw advised to call a vet immediately, so I dialed the number of the nearest 24 animal hospital (about 40 miles away). They told me to give him a teaspoon on hydrogen peroxide to induce vomiting. After a quick run to CVS, we managed to do this — and it worked! Up came a rather impressive pile of all the things Cupcake had eaten recently including a whole lot of raisins. I thought that would be it, but the vet told us we needed to come in none-the-less. We got to the clinic and immediately felt out of place. Obviously the other pet owners were there with really sick animals (who were howling and whimpering sadly from behind closed doors), while our dog was scampering around, as cute and energetic as ever. How could anything be wrong with him? The doctor called the Animal Poison Control Center, to get the prognosis. She came into the exam room grim faced and told us this is very serious, and Cupcake would have to spend two nights at the hospital, and be treated with intravenious fluids and charcoal to flush the toxins out of his system. After this — and a $1500 bill — she promised he would be 100% well. Reluctantly, we left our dear dog at the clinic and headed home to a much emptier house. I called every twelve hours to check on him, and got nothing but positive news. He came home today with a funny cone around his neck, a shaved leg, brimming with wags and kisses. It’s possible that he would have been fine if we hadn’t taken him to the hospital, but who could take a chance like that? We’re so happy to have him back. And for the record, we now live in a raisin free house.